Environmental contaminants can have serious and long-term impacts on reproductive and child health. Information about these risks, and how to address them, is new to many service providers. As awareness increases, information about environmental risks will become an accepted part of standard care for preconception, prenatal and child health. This manual focuses on how to prevent or reduce environmental exposures via actions that can be taken at the community or societal level. It shares strategies that can be used to increase awareness and change behaviour and reflects on underlying conditions that create harmful exposures in the first place. 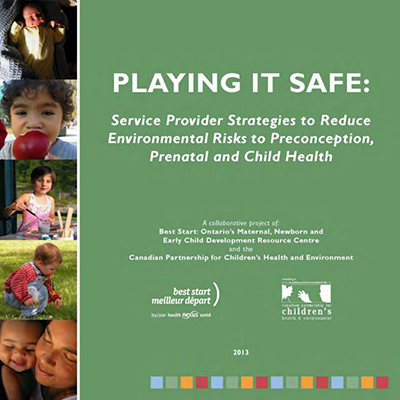 This manual is a companion to Child Health and the Environment – A Primer and the brochure Playing it Safe: Childproofing for Environmental Health, produced by the Canadian Partnership for Children’s Health and Environment (CPCHE).